NOTE: Before starting Unit 2: Assignments #1 through #4, look at Assignment #5 so that as you work through Assignments #1 through #4 you can assemble materials for Assignment #5. To appreciate why it’s important for you, a 21st century college student, to become more digitally literate, read this excerpt from Ventimiglia and Pullman’s (2016) article, “From Written to Digital: The New Literacy.” Figure 1 (on the third page of the PDF) would make excellent grist for the “Why am I learning this?” section of your Course Journal for this Unit. Read Wineburg’s (2016) overview of the Stanford Digital Literacy study. Test yourself on both the first set of example items and the second set of example items from the Stanford Digital Literacy study. Make sure you read through all the examples of students’ correct and incorrect answers (and why their answers were correct versus incorrect). Read the following documents, each of which explains several steps for improving digital literacy. Make a list of all the steps. (You should have more than 20 steps on your list.) Although it might feel as though these documents re-mention some of the same steps, overlap and repetition are always helpful for learning, and each document explains some steps that the other articles don’t. Which five steps for improving digital literacy were you the most familiar with before reading these documents? Which five steps were you the least familiar with before reading these documents? Which five errors that students made in the Stanford Digital Literacy study (illustrated in either the first or the second set of example items, or both) surprised you the least – and why did those five errors surprise you the least? discuss, in at least 100 words, whether any of the Cognitive Biases you learned in Unit 1 play a role in these psychological tendencies. If so, which ones? Read Wikipedia’s (no date) entry on Snopes.com. Skim-read through FactCheck.org’s (no date) fact-checking of rumors about the creators of Snopes.com. From Snopes.com, find out the truth about five non-political Internet rumors or urban legends that are interesting to you. By “non-political” we mean NOT “pertaining to the government or the public affairs of a country,” meaning not about government, government officials, such as Congress members,or candidates (past or present) for political office. Some examples of non-political Internet rumors or urban legends are the following: If you go swimming less than an hour after you eat, will you get stomach cramps? If you swallow chewing gum, will it take seven years to digest? Does our hair grow back darker or thicker after we shave it? Do we use only ten percent of our brains? Did Coca-Cola used to contain cocaine? Become familiar with this list of satire websites. Watch CNN’s Anderson Cooper admit to having been tricked by a satire website. You can adjust the speed on this YouTube (or any YouTube) by following these directions. 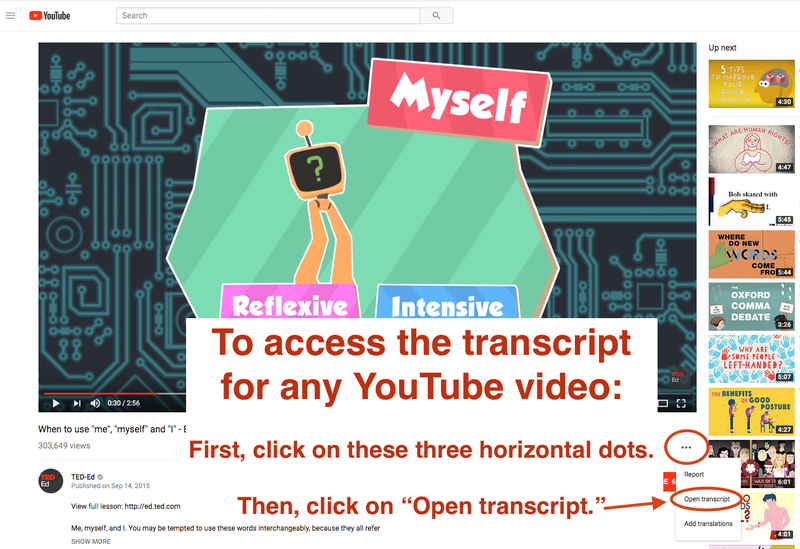 You can access a transcript of this YouTube (or any YouTube) by following these directions. Find two non-political instances, which are of interest to you, of other persons (besides Anderson Cooper) who have been tricked by a satire website. Describe the five non-political Internet rumors or urban legends that you found out about on Snopes.com. Provide a link for each Internet rumor or urban legend (using the technique you learned from the Course How To so that your link will show up as actual text, rather than just a URL or the word, Link). Explain why these Internet rumors or urban legends were of interest to you. Describe the two non-political instances of persons (besides Anderson Cooper) who have been tricked by a satire website. Provide a link for each tricked-by-a-satire-website instances (using the technique you learned from the Course How To so that your link will show up as actual text, rather than just a URL or the word, Link). Explain why these tricked-by-a-satire-website instances were of interest to you. Read Walton’s (2017) article, “’Psychological Vaccine’ May Protect Against Fake News, Alternative Facts,” which is about a study conducted at Cambridge University. Read Wood’s (2017) article, “Psychological ‘Vaccine’ Could Help Immunize Against Fake News,” which is about the same study conducted at Cambridge University. Read Bergland’s (2017) article, “Fake News ‘Vaccine’ Inoculates Against ‘Alternative Facts’,” which is again about that study conducted at Cambridge University; the repetition (with variation) is purposeful (as a mechanism for learning); at this point, you should understand the study well. Go to the Unit 2: Assignment #4 Discussion Board and make a new post of at least 200 words in which you propose a way to override (in readers’ minds) false digital information. To consolidate all the information about digital literacy you have learned in this Unit (from Assignment #1 through Assignment #4), create a document that could be used to teach this information to other people. (You do not have to teach the information to other people, but you do have to create a teaching document. First, choose your audience. Your choices are (1) other college students; (2) middle-school students (age 12 to 14 years); or (3) older adults (over age 60). Next, choose your medium. Your choices are (1) a PowerPoint; (2) a handout or Infographic; or (3) a comic strip (e.g., this comic strip from The Nibs). Your teaching document should summarize each of the first four Assignments in this Unit and be relevant to your audience. Save your document as a PDF named YourLastname_DigitalLiteracy.pdf (no .pptx, .ppt, .doc, .docx, or any other file types except for .pdf will be graded). Look underneath the textbox where you typically type (or paste into) the Discussion Board, and you will see the “Attach” tool; it is the word “Attach” preceded by a paperclip icon. Click on the “Attach” tool. Browse to the .pdf file on your computer and select your .pdf file. Do not attach your .pdf file by using the “Files” menu option on the left-hand side of the Discussion Board. Instead, use only the “Attach” tool that is found underneath the Discussion Board text box. Be sure that your PDF is named YourLastname_DigitalLiteracy.pdf. If it’s not obvious who the intended audience of your teaching document is, you should inform us of that in the Discussion Board textbox (but we hope your intended audience will be obvious from your teaching document). Starting in the next unit (Unit 3), you will begin having synchronous, text-based Group Chats (of two to three students) at the end of each unit. Each Group Chat will last one hour. Find out which Chat Group you are in by consulting this Chat Group List. NOTE: This is a password-protected PDF. You’ll need to type in a password to read the PDF. Or save the PDF onto your own computer, and open the PDF there (using Adobe Reader, Preview, or another PDF reader), rather than trying to open the PDF in your browser. After you’ve found out which Chat Group you’re in, arrange with the other members of your Chat Group a time when all of you can meet online for one hour to hold your small group text-based Chat for the next Unit (Unit 3: Assignment #6). You can contact other members of your Chat Group through their wisc.edu email addresses, which you can obtain by clicking on any student’s name in the Chat Group List. Or members of your Chat Group may decide to share phone numbers for texting. Remember, when you’re emailing (or texting) with your Chat Group to “Reply All.” By remembering to use “Reply All,” you won’t inadvertently leave anyone off your communications for arranging your meeting time. what to do if your Chat Group agrees on a date and time for your Chat, but one member hasn’t joined the Chat within 15 minutes after the agreed upon time. Read the posts made by other members of your Chat Group. Then, each member of the Chat Group must make a response (a reply) to the other member(s) of the Chat Group. Each of your responses should be at least 200 words. Check your grades in the course by following the instructions for “How To Check Your Grades in this Course” in the Course How To. If you have any questions about your grades, email Professor Gernsbacher. Record a typical Unit entry in your own Course Journal for the current Unit, Unit 2. Congratulations; you have finished Unit 2! Onward to Unit 3!